Murray brings his wealth as both a Pastor and Seminary professor to an important topic that is well written and easy to understand. So many people (myself included) often fail to see that Jesus played a large and active part of the Old Testament. 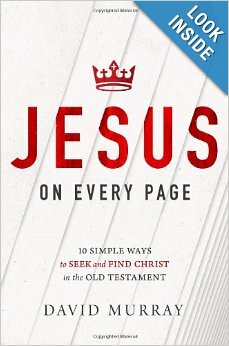 Murray brings clarity on how to find Jesus in the Old Testament in just 256 pages. Murray gives specific example of Jesus in the Old Testament throughout the book. The fact that the Old Testament is larger than the New Testament it is a great wealth to the knowledge to walk out our lives with and for Jesus. Murray contends that the Old Testament should not be seen as minor or less important to the New. Murray states “Jesus Himself used New Testament light to interpret the Old Testament scriptures.” Jesus often quoted the Old Testament and until the Epistles it was the only Bible the early church had. Murray brings to life the fact that the Old Testament not only points to Jesus as the coming Messiah but also Jesus was working and moving in the people and events from Genesis to Malachi. Parts of the book are a bit dry and on an occasion or two some of the supporting documentation was lacking. However, Murray has put together a great source of information that is useful to any student of the Bible. Disclaimer: I purchased my copy of Jesus on Every Page, and I have not been asked by the author for this review. What other books or resources can you suggest that help us see Jesus in the Old Testament?